Not being able to drive to the trail – heads is a little frustrating. Yesterday we tried to hike to Laurel Falls Trail which ultimately loops over Cove Mountain and back down to Cataract Falls, which is an easy walk from our apartment. If the park was open, Christine said she could help get us outfitted for back country hiking, which this loop would require. In any case, we decided to walk to the Laurel Falls trail – head. It was at three and a half miles up a steep incline that we decided to take pictures at Fighting Creek Gap, eat our lunch and head back down the hill. The vista was enough to make it worth the while. I was so sore that I drove Bill to the Gatlinburg Trail with his fishing rod before I headed to the picnic tables to get my daily dose of internet. I’m not as young as I used to be. 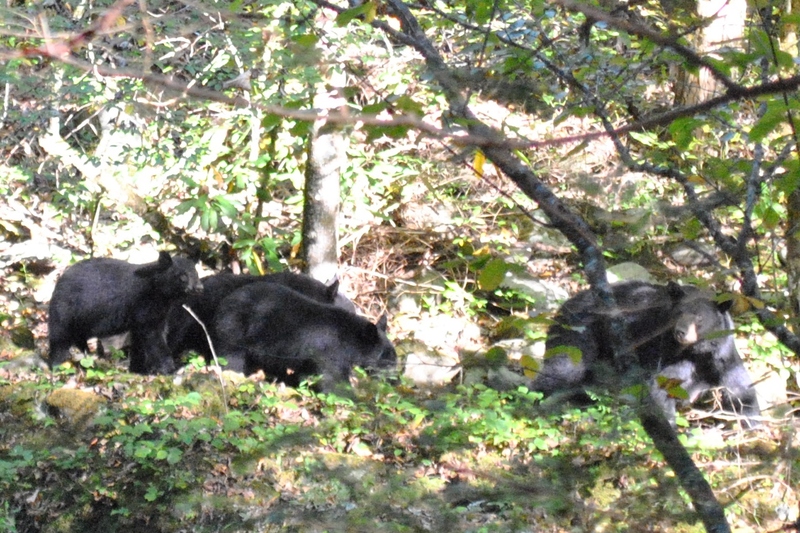 This time, Bill had his camera when the bears were at the creek crossing. There are a mama and three babies that live in our neighborhood. The park estimates a population of fifteen hundred. This year there was a bumper crop of bear cubs; a rare occurrence that happens two years after a bad food shortage. I’m wondering if the bears are a trite subject for a woodcut or if they are just perfect considering my current environment. How exhilarating (and perhaps a bit unsettling?) to see bears, esp. babies, and to know that they live in your area. Surely they are fit subjects for any artwork. As for your soreness, I concur that it increases with age. Congrats on hiking as much as you do there. How’s the weather? It’s cool and rainy here; a coastal storm has been moving up the coast from the Carribean. I had two and a half warm, sunny and breezy days in Myrtle Beach (swam and sunned), followed by the same number of rainy, cool days. Went to Charleston on one of the latter, visiting a museum and two historic houses. Shopped on the other. Am enjoying your blog, Martha.